Commerce and Industry Minister Nirmala Sitharaman has said that the revised Foreign Trade Policy (FTP) would be released early to synchronise the same with roll out of GST. "A valid suggestion has come that this mid-term review (of the FTP) should be concluded and rolled out simultaneously with the GST so that the FTP and the GST are on parallel tracks," the minister told media following a stakeholders' meeting on Saturday in New Delhi. The core focus of the revised FTP would be promoting exports from the SMEs and high employment potential sectors, she added. 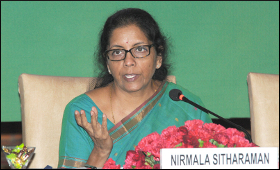 Sitharaman was chairing a meeting on the Mid-Term review of the Foreign Trade Policy 2015-20 organised jointly by Department of Commerce and Research and Information System for the Developing Countries (RIS) . Major suggestions discussed during the deliberations related to promoting Rupee Trade, facilitating not only exports but also imports and reducing cost of credit. Participant recommended harnessing the high foreign exchange earnings and large employment generation potential of services related to the Tourism, Education and Health sector. Such services fall under the WTO category of the Mode 2 Services, also called the ‘Consumption Abroad’ category. It was emphasised that promotion of mode2 in services sector shall contribute in domestic economic development and job creation. It may be noted that while announcing the five year FTP, 2015-2020 on 01.04.2015, Commerce & Industry Minister had announced that the policy would be reviewed on mid-term basis. The exercise has been initiated by Department of commerce in January 2017. DGFT has held consultation with a cross section of stakeholders.- Exporters, Traders, Export promotion Councils, Commodity Boards, Various Ministries of the Central Govt., State Governments, foreign missions of India and Industry Bodies- in this regard. Commerce Secretary Rita Teaotia, Chairman RIS Hardeep Singh Puri and DGFT Ajay Bhalla also participated in discussions. The event was attended by the trade policy experts from the industry, academia, Research and Government.